I really thought this would come out a whole lot better than it did. I am not completely happy with this set, but I will still wear it and get some feedback, maybe someone will like it. 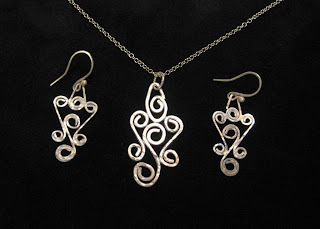 Filigree is something I have been thinking of trying for quite some time, and I had mastered it in my brain a long time ago. I didn't realize that my brain's idea of this design and my actual execution could be so different. I really had this all figured out, but the finished pieces are not up to par to my original idea. I will practice more and maybe someday I will have something to be proud of. I wanted this to be totally plain, but since the outcome wasn't so perfect, I decided to texture and hammer a bit to mask the mistakes. There are a couple of joins that didn't solder, too, so don't be too judgemental, I already know they are not perfect. Enjoy. 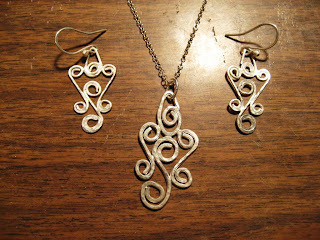 I don't know if you can tell by the pictures or not, but the earrings are much nicer than the pendant. I will try again, and post my next attempt. I still really like the design, but I think I can do better...yes...for sure I can do better. Wow, that is really cool stuff!! Pee-Ess: Did you like, uninstall yahoo messenger or something?